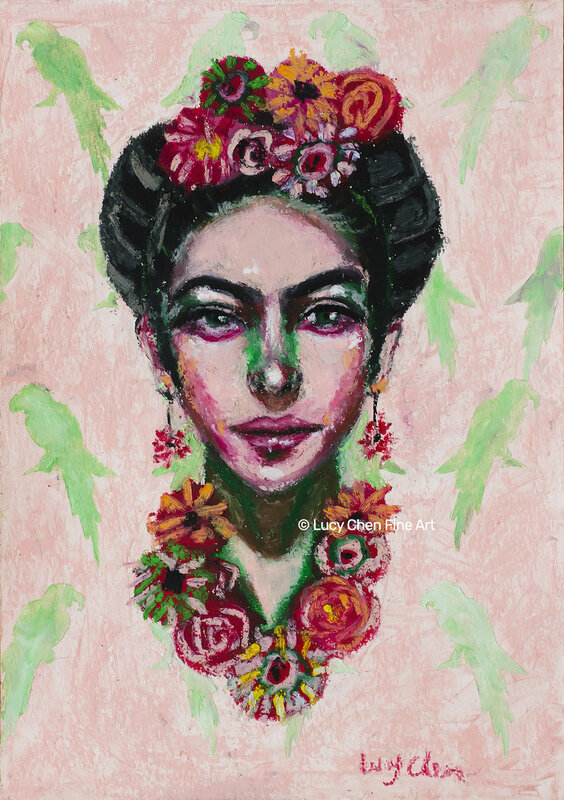 FRIDA, by Lucy Chen, oil pastel on paper. SOLD. Frida Kahlo has to be one of our favorite artists, especially for female artists, I think? There is no way that as you learn about art and artists and come across Frida, get to know Frida, and don’t appreciate her talent, and her strength and authenticity. It is simply impossible! Over the last few years since I started painting, I have made some oil paintings of Frida, which you can see featured in the video below. This new Frida painting in done in oil pastel, and it was a fun and quick project. In this time-lapse, I break down the process into 6 simple steps. Enjoy! For tutorials and art courses I teach, find out more here. To connect with me on social, find my Instagram here, and join our private Facebook Group here and share your paintings of Frida!